I'm a bit overwhelmed by the available options in regards to the three major photo editing apps from Adobe. Does anyone know of an article or site that lists the features of Lightroom, PS Elements, and PS, side by side? I know that Lightroom revolves around edits and workflow, and that PS is the big kahuna of image editing. Where does Elements fit in to this understanding? The three tools approximate three general levels of functionality and capability. Photoshop Elements is an entry-level image editing package. It provides image editing and some library management capabilities. It has some rich capabilities, and supports all the common editing capabilities of Photoshop. Adjustment layers allow non-destructive editing to a degree, however there are fewer adjustments possible in Elements than Photoshop. It is limited, and if you do a lot of photographic editing, you will eventually run into Elements' many limitations. Photoshop Lightroom is a professional image editing package. It is specifically geared towards the digital photographer with an advanced workflow, RAW image support, and extensive library management capabilities. It is designed to expose the key tools important to editing digital photographs, such as a histogram, white balance and tone adjustments, color adjustments, detail adjustments (i.e. noise reduction and sharpening), as well as some advanced features like camera and lens profiles to correct distortion and vignetting. Lightroom also offers some rich tools that go beyond the basic on-screen editing, including print and book creation, slideshow generation, and web site publishing. New publishing modules in Lightroom 3 allow direct upload of your images and metadata to sites like Flickr and Facebook. Photoshop CS is the ultimate image editing program. It is a low-level tool, giving you direct and total control over pretty much any edit you can think of. It's capabilities extend far beyond photographic editing and support artistic image creation and editing of a very wide variety. For a photographer, Photoshop brings HDR generation and editing, panoramic stitching, and a whole host of additional tools that are not available in Lightroom. Photoshop lacks some things provided by Lightroom, however, particularly its ease of use and clean workflow designed specifically to optimize a photographers image management, editing, and publishing. The most common and useful operations that need to be performed on digital photographs can be completed in much less time with Lightroom. Photoshop itself lacks any real kind of library management outside of Bridge. If you do very light weight photography with only the most basic of edits, use Photoshop Elements. If you want more control and/or have a large catalog of images (more than a few thousand), or want Photoshop-level support of RAW tools, Lightroom is highly recommended. It can act as the central tool for managing, editing, and publishing your photographic works. It has an ideal price point, making it easy to acquire. Photoshop CS is a great tool to have to cover the cases where Lightroom is lacking, such as pixel-level editing or modification of your image. In previous versions Lightroom lacked the ability to soft-proof (simulate printed output on the screen) and support for ICM color profiles for various output devices, but this is no longer true. I found the above responses interesting in that I am pretty familiar with PSE (all versions except 11) and I can do just about all the LR and CS edit functions mentioned above, I can do in PSE (some may take a few more clicks). Note I mentioned "edit functions" not organizer functions where LR wins and clearly CS wins for batch processing. PSE now has layer masking, selection edge optimization, a ton of layer blending modes, etc. The big negative for some (not me) is that PSE uses "Levels" instead of "Curves", which can be acquired with PSE+ for $12, and layering is limited to 8 bits (which hasn't seemed to cause me to lose business) which is basically all I care about. I see it this way: if you're a photographer (or a serious amateur), go with Lightroom. I think LR is a very, very good tool for a photographer. If you need to change not only how the image appears but you want to give a completely different aspect to your images (more of a designer/artist/painter job) then go with Elements. This means that you don't mind building a library, storing metadata, directly exporting html pages for the web, etc. If you fall in the previous example AND you're rich :) then go with Photoshop. It's huge, it's expensive. Content-aware fill drives me crazy. You may even buy Lightroom and Photoshop, the tools integrate well. > "Does anyone know of an article or site that lists the features of Lightroom, PS Elements, and PS, side by side?" 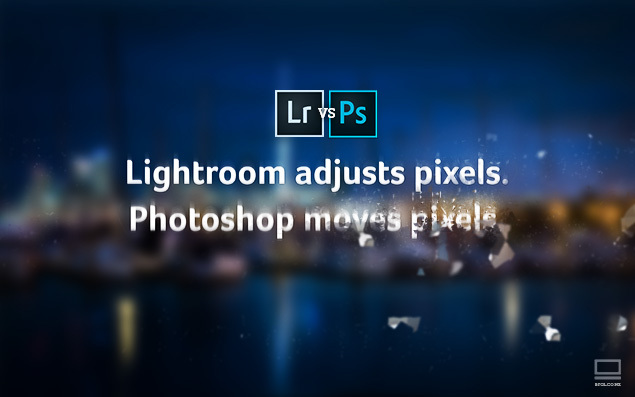 What's Are the Differences Between Adobe Photoshop CS vs. Lightroom vs. Elements? Hope that helps with some of the key details and adds to the conversation. It's not a true side by side comparison, and it doesn't cover all the features, but you could take a look at the photo editing program comparison at Adobe.com. It's a pretty minor point, but Elements directly supports image acquisition from a scanner, while Lightroom, perhapes due to its being specifically geared towards photography, doesn't allow it (for sure up to version 3.6, and I think that 4 still doesn't implement it). I think @jrista covers it very well, but I thought I'd add my opinion too. I use Lightroom 4 90% of the time, and it works great for all the reasons @jrista said. Since CS6 though, I've started subscribing to Photoshop. I used Elements a bit and didn't like it, (to me, it was less of a "middle-ground", and more of a "doesn't quite do anything properly), but paying for full Photoshop in one go was never realistic. Now though, for that 10% of the time, I can use Photoshop with a clean conscience. LR and PS complement each other very nicely indeed. If you want to change pixels non-destructively (as many times as you want) then Lightroom is your game. If you want to move pixels (in more ways than you can imagine) then its Photoshop for you. Not the answer you're looking for? Browse other questions tagged lightroom software photoshop photoshop-elements or ask your own question. Which version of Photoshop should I choose? Why do we even need RAW-specific editing software? How to use Lightroom and Photoshop Elements together? Is there something similar to Adobe Lightroom for Linux? What is Lightroom *really* doing when I change a Camera Calibration?